Heat oven to 425°. Spray jelly roll pan, 15 1/2x10 1/2x1 inch with cooking spray. Cut each bacon slice in half. Calimyrna figs are large, squat, green-skinned, white-fleshed figs grown in California. You can use dried apricot or peach halves, folding in half around the nut, instead of the figs. 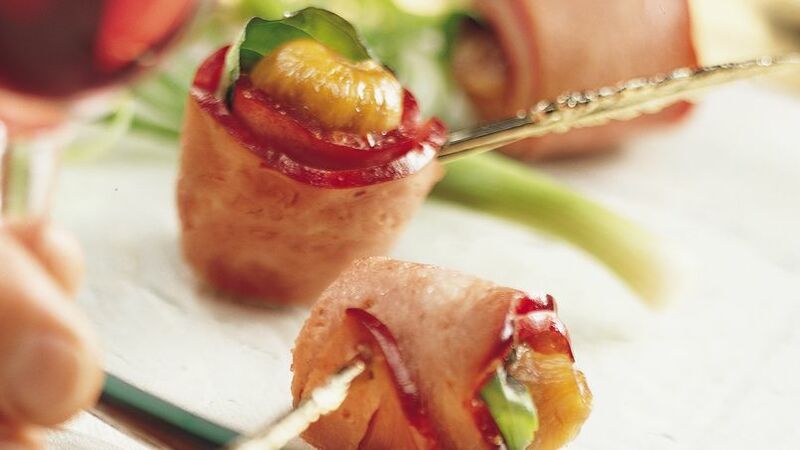 Assemble appetizers 3 to 4 hours ahead of your party and refrigerate. You may need to add 1 to 2 minutes to the bake time. Cottage bacon is taken from smoked pork shoulder. Although it is a leaner form of bacon, it does have more fat and more flavor than Canadian-style bacon.